Ok, this is it. I have used up all my leftover sugar cookie mix. Phew! I still can't believe how much stuff I filled up my pantry with over the holiday season. The pile is finally getting smaller. 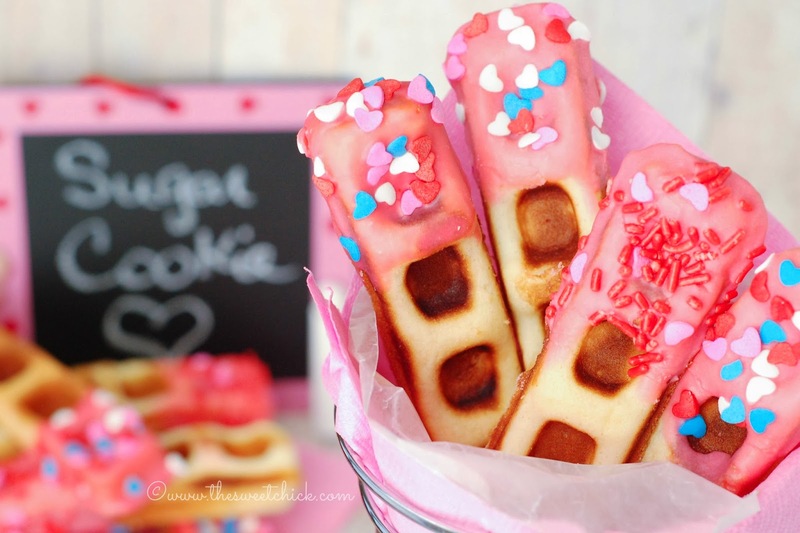 I thought these waffle sticks would be cute for the kids. I think I only used my Bella Waffle Stick Maker once so far. I bought it at Target for $10 or something on clearance. One of those impulse purchases that always happen to me at Target. The sprinkles are from the Target $1 bins. I might have to call up Target and ask if I can be their new spokesperson because I buy so many things there. For this recipe I just slightly adapted my Mini Sugar Cookie Donut recipe. I added a little sugar and some corn starch to make the waffles more crispy on the outside. 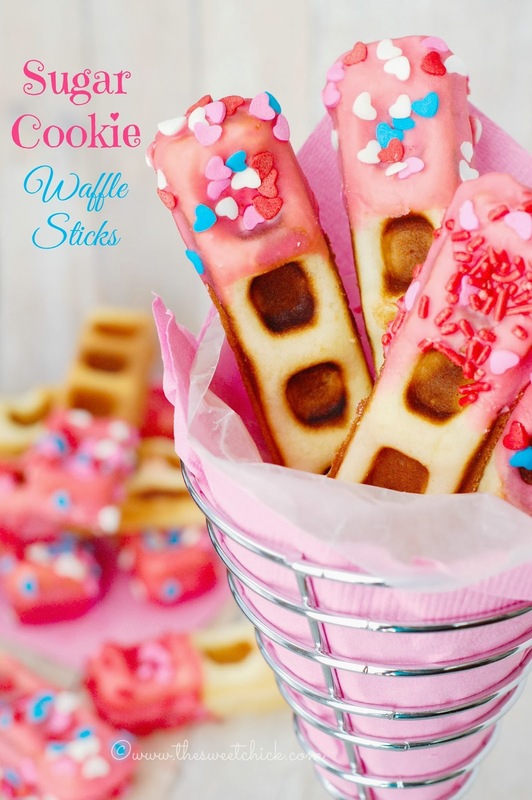 I used my Bella Waffle Stick Maker. I know Babycakes make one also or you can use a regular waffle maker. I just don't know how many waffles it would make. My machine makes 6 waffle sticks at a time. I use my Tovolo Pancake Pen to fill each cavity with batter like I do for my donut maker and cake pop maker. It just so much easier and more accurate than a measuring cup. You can also use a plastic bag with the tip cut off if you like. These baked up in about 3-4 minutes. It just depends on whether it is the first couple of batches or the last batch. When warm, straight out of the machine, the outside of the waffles did come out crispy with a soft center, like a Belgian waffle. You can eat them with some maple syrup or slather them with jam. You can probably freeze some and reheat in a toaster oven later. I wanted to have a little fun with them, so I let them cool completely and placed them in an airtight container until I was ready to glaze them. A little glaze and sprinkles always makes dessert more fun. The waffles did lose their crispiness at this stage, but didn't lose their flavor. They came out tasting similar to the Mini Sugar Cookie Donuts. And that's not a bad thing since those donuts were oh so yummy. Preheat your Bella Waffle Stick Maker. 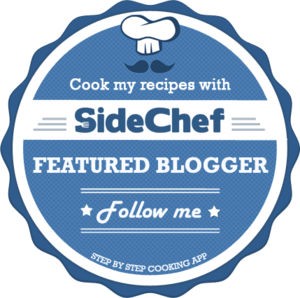 In a medium bowl, mix together the dry sugar mix, baking powder, corn starch and sugar. 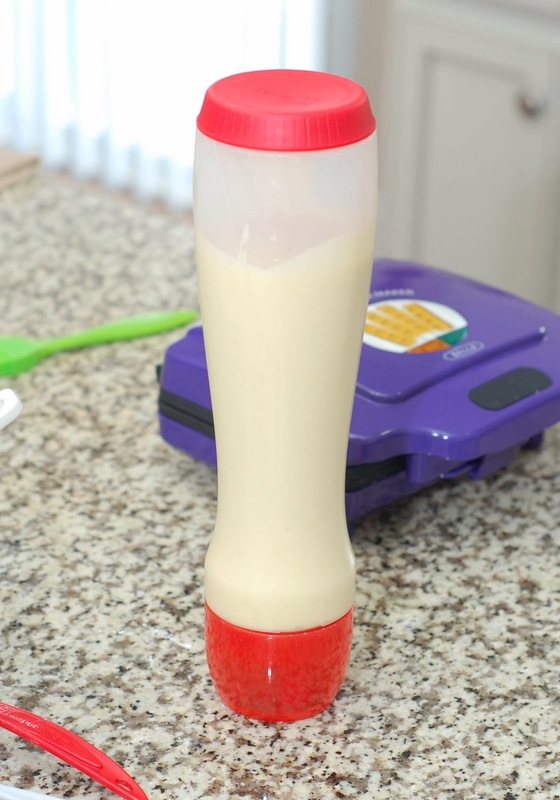 Then add the egg , butter, oil, and curdled milk. 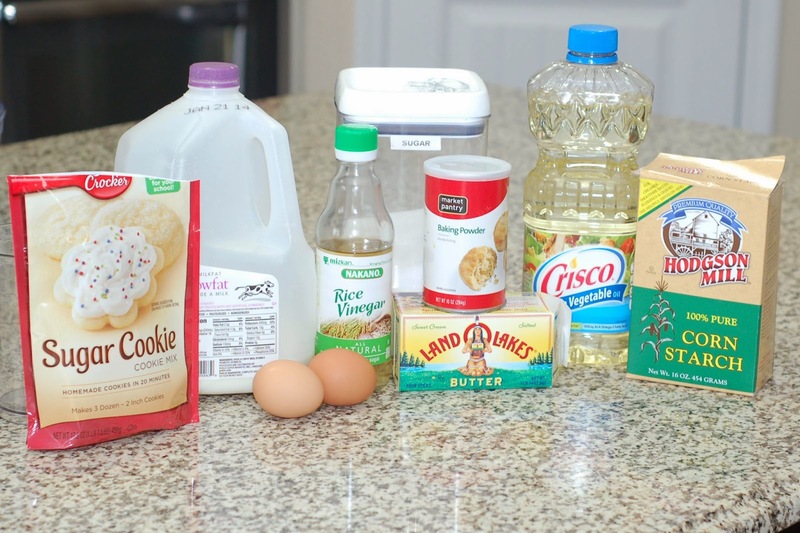 Mix until completely blended, using a whisk or a hand mixer. Use a piping bag, a Ziplock bag with tip cut off, or a pancake pen, fill each waffle reservoir flush to the rim with the batter. Bake for about 3-4 minutes or until toothpick inserted in center of the waffle comes out clean. Place hot waffles on cooling rack with a wax paper underneath and prepare the glaze. Dip the tips of each cooled off waffle in the mixture ,then place back on the cooling rack until the glaze is dry. 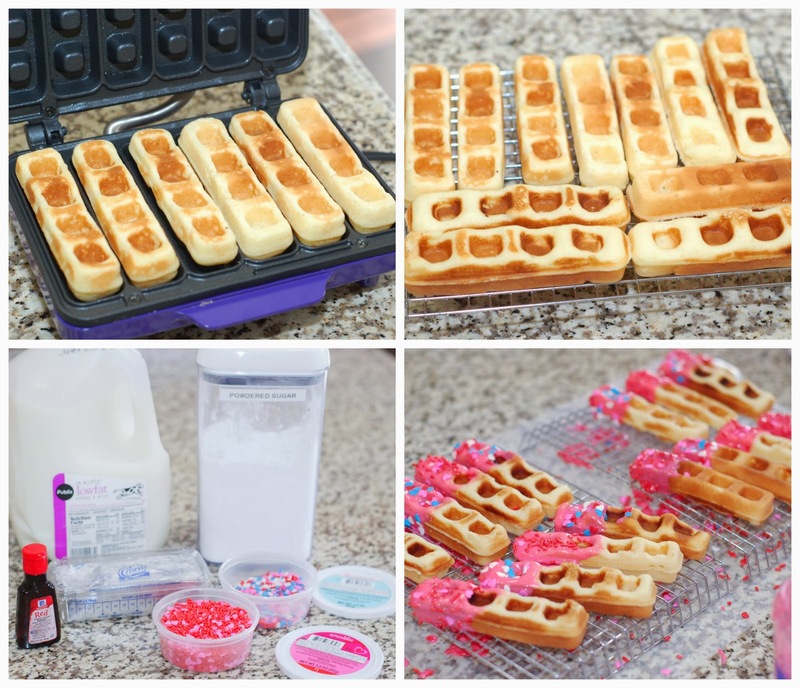 Cute way to use a waffle maker for more than breakfast. So cute and looks delicious! Thank you for pinning Linda. I will see you again on Friday. Very cute idea. My kids would love these. I'm just popping over to tell you, this post is being featured at The Wednesday Roundup (this makes 2 features in a row, right?!) Don't forget to come by and grab your feature button for bragging rights! Thanks Christine. I put the waffles as a treat in my daughter's lunch box. I didn't realize I was featured again till you mentioned it. I did put a button the first time. I have it on my featured page. Thank you Heather. My kids enjoyed them. Thanks for stopping by. I love your Lila doll! I wish I was good at sewing or crocheting. I have never had pickled okra. I just tasted okra for the first time this year after we moved south. I will have to find someone that pickles it I guess. Could you use a Bella round Belgian waffle maker for this??? 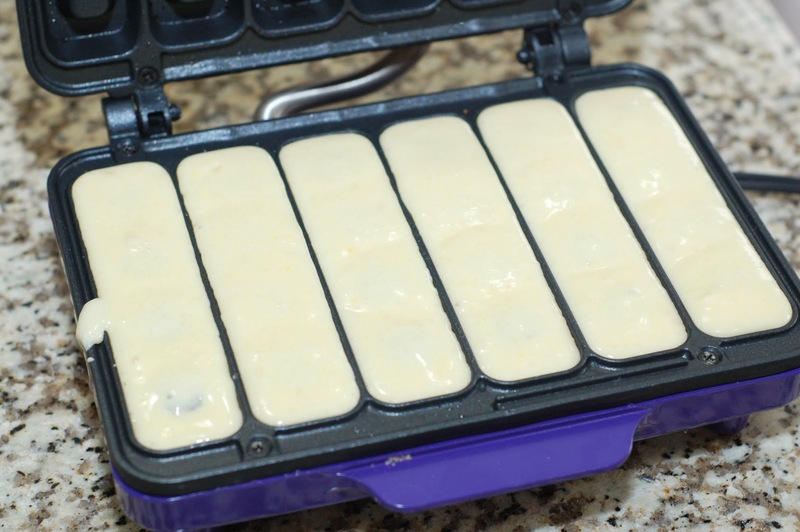 You can use the batter to make regular waffles. I just don't know how many it will make. If you cut the waffles in 4, you can still dip one of the ends in the glaze. Cute idea. Have to try a version of these.